Forget plastic handlebar tape. It's an oil-based product which make it so planet unfriendly. Now you can revel in the luxury of 100% eco-friendly, organic cotton bartape from Green Grips. In addition to the obvious benefits to the environment, Green Grips bartape enhances breathability to your hands and is great for riders with rubber allergies or for those with sensitive skin. Plus, Green Grips ship product to dealers in reusable plastic containers, creating no waste. "We just love Green Grips because not only is it an Earth-friendly product, but also because it's a quality product," says Karen Peterson of Lexco, the distributor of Green Grips. "The other significant appeal of Green Grips is that the tape is not only perfect for handlebars but also for anything else you can get your hands on including gardening tools, baseball bats, you name it." Says Kelley McDonell, who along with her fiancé, Derek Sisko, founded Green Grips: "We started the company because when I took up cycling recently I discovered that I was allergic to rubber hand grips. Derek and I searched for quality cotton bartape, couldn't find any, so we decided to create our own product and manufacture it out of 100% organic cotton." For now, Green Grips is only available in "Natural" color. The company plans to expand into more colors and products in the future. 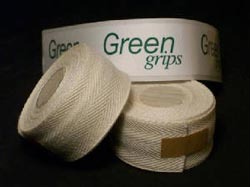 Green Grips is sold in three-yard rolls (with separate strips of finishing tape included). MSRP is $6 per roll. IBDs can order the product in 20-roll increments through Lexco. For details, call Lexco toll-free at (800) 626-6556.